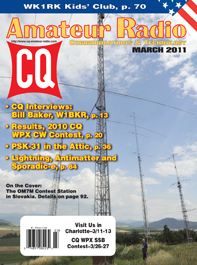 The March issue of CQ starts out with our latest CQ interview, chatting this time with retired TV executive Bill Baker, W1BKR. Bill helped shape the current broadcast and cable industries, then spent 20 years at the helm of the nation's number one public TV station. He's also been to both the North and South Poles and has a large collection of TV station clocks and microphones. For more photos of our Empire State Building transmitter tour and other details that wouldn't fit in the print version, click here for "Digging Deeper With Bill Baker, W1BKR." Next, we have the CW results of the 2010 CQ World Wide WPX Contest and yet another record number of logs submitted, despite poor band conditions for all but the first six hours of the event. 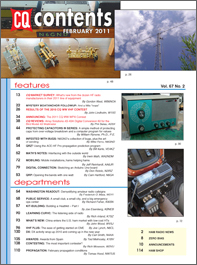 World top scorers included EF8M (Single Op, All Band), AE6Y (SOAB-Low Power), YT4A (Single Op, Single Band), TM77M (QRP), KP2M (Single Op, Assisted), P33W (Multi Op, Single Transmitter), C4I (Multi-Two), and CQ3L (Multi-Multi). Finally among our March features, Stan Zawrotny, K4SBZ, explains how he got around strict outdoor antenna restrictions by going digital in "PSK-31 in the Attic." 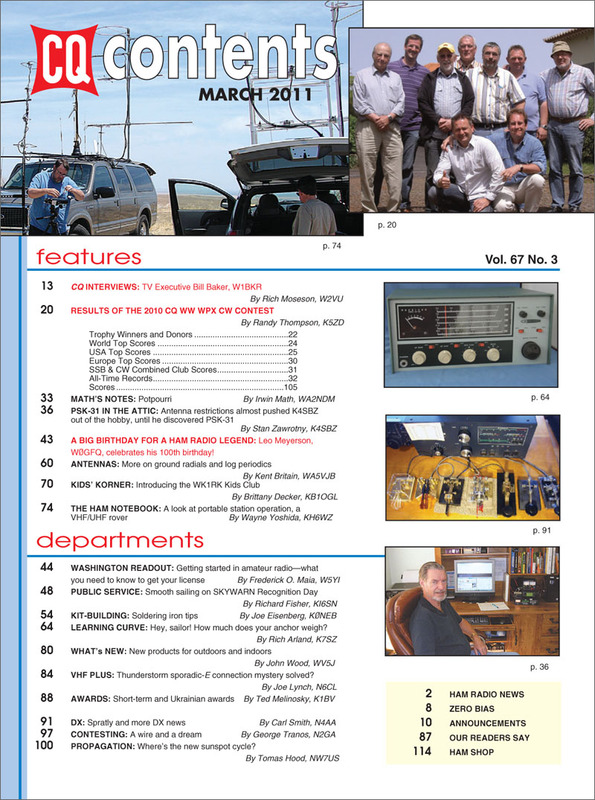 Among our columns this month, "Math's Notes" editor Irwin Math, WA2NDM, dips into the mailbag to provide some circuit ideas in response to reader requests; "Washington Readout" editor Fred Maia, W5YI, reviews the basic steps needed for getting a ham license; and Public Service Editor Richard Fisher, KI6SN, reports on "Smooth Sailing on SKYWARN Recognition Day." Kit-building Editor Joe Eisenberg, K0NEB, shows us how to build our own variable heat soldering station; Antennas Editor Kent Britain, WA5VJB, offers more on ground radials, as well as a look at log-periodic antennas; and "Learning Curve" editor Rich Arland, K7SZ, starts a series on restoring vintage radios, lovingly known as "boat anchors." Kids' Korner editor Brittany Decker, KB1OGL, introduces us to a kids' club in Ohio that was built around a single family with multiple hams; "Ham Notebook" editor Wayne Yoshida, KH6WZ, looks at operating portable with a focus on "rover" stations in VHF contests. New Products Editor John Wood, WV5J, spotlights a new handheld from Kenwood, a new SWR/Wattmeter from Daiwa and several other new items in the ham radio marketplace. VHF-Plus Editor Joe Lynch, N6CL, ponders whether there's a link between sporadic-e and a recent discovery that thunderstorms launch beams of electrons -- and antimatter positrons -- upward into the ionosphere. 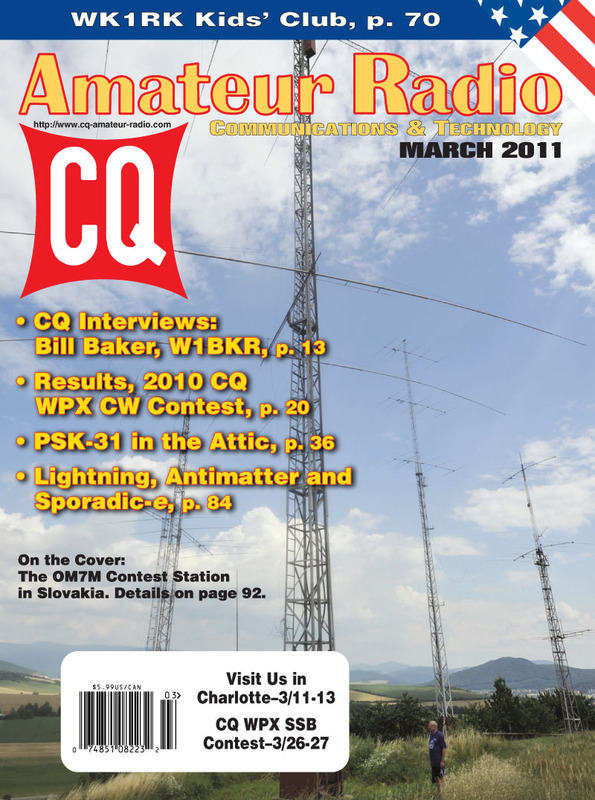 Awards Editor Ted Melinosky, K1BV, looks at some short-term awards as well as a series of awards offered for contacting stations in Ukraine; DX Editor Carl Smith, N4AA, discusses the latest delay in the DX0DX expedition to Spratly; we introduce George Tranos, N2GA, as our new Contesting Editor, and Propagation Editor Tomas Hood, NW7US, asks (and answers) the musical question, "Where's the New Sunspot Cycle?" That's a brief look at what's coming up in the March issue of CQ magazine, which should be on newsstands and in subscribers' mailboxes by late February or early March. For information on becoming a CQ subscriber, Click Here. Zero Bias - "Appliance Operators?"